Asus probably isn't the first company that comes to mind when you think of big desktop replacement laptops that are optimized for gaming. The Asus G75VW, however, is the latest in a long line of gaming laptops produced by the company under the "Republic of Gamers" brand. Considering that gaming laptops often go for well over $2000, this big machine is relatively budget-priced, and it isn't awful--but it isn't great, either. Although it suffers in general performance, audio quality, and battery life, it has a nice screen, and the price may be right. Our review model, priced at $1500 (as of May 23, 2012), sports an Intel Core i7-3610QM processor, 12GB of RAM, 1.5TB of hard-drive space, and an Nvidia GeForce GTX 660M graphics chip. It also has built-in 802.11b/g/n Wi-Fi, Bluetooth 4.0, and a Blu-ray/DVD combo drive. The G75VW runs the 64-bit version of Windows 7 Home Premium. In our WorldBench 7 benchmark tests, the G75VW posted a paltry score of 97. This means that the G75VW is 3 percent slower than our baseline system, which is not an impressive achievement for a desktop replacement laptop. After all, our baseline system is a desktop PC with an Intel Core i5-2500K processor, 8GB of RAM, and an Nvidia GeForce GTX 560 Ti graphics card. A WorldBench 7 score of 97 is far from outstanding for an all-purpose laptop, let alone a desktop replacement specifically designed for gamers. 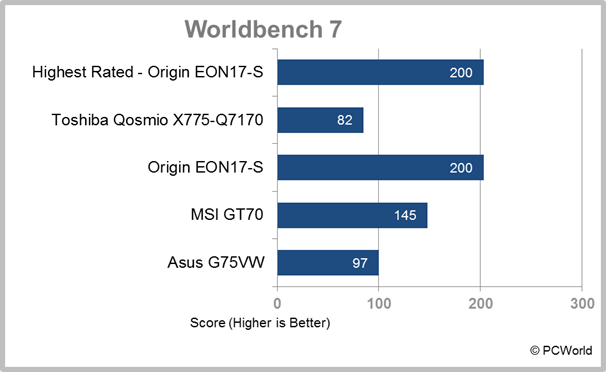 The G75VW's performance in our graphics and gaming tests was a little better than its WorldBench 7 showing, and much closer to what we expect from the desktop replacement category. In our Crysis 2 graphics tests, the G75VW managed a frame rate of 30.8 frames per second (high quality settings, 1980 by 1080 resolution), which isn't terrible. 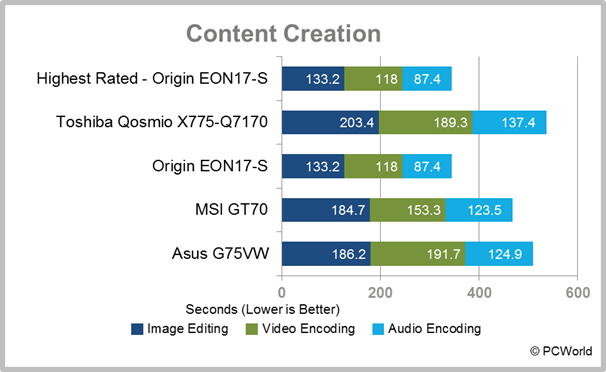 For context, on the same graphics test the Origin EON17-S produced a frame rate of 43.1 fps, while the MSI GT70 managed a frame rate of 33.8 fps. Like most huge desktop replacements geared toward gamers, the G75VW doesn't boast impressive battery life. In our tests it lasted for 2 hours, 35 minutes, coming within 3 minutes of the Origin EON17-S, currently the highest-rated product in this category. There are few ways to make a hulking, 9.5-pound desktop replacement attractive, but Asus does a decent job of it by giving the G75VW a wedge-shaped chassis with slick angles and a soft, rubberized plastic black cover. The G75VW looks a lot like its predecessor, the G74SX, but it's a tad lighter (9.5 instead of 9.9 pounds) and a bit thinner (2.04 inches at its thickest, versus 2.4 inches). It still comes with a hefty 2-pound power brick, however. The interior is also attractive, with a brushed-metal keyboard deck, a rubberized wrist-rest area, and a silvery Republic of Gamers logo. A few pinprick-size white and green LEDs on the bottom-left corner of the computer indicate battery status, Wi-Fi, eco-mode, and the like. The LEDs are bright, but not distractingly so. As for ports, the G75VW is fairly packed, with four USB 3.0 ports (including one sleep-and-charge), ethernet, headphone and microphone jacks, and a three-in-one card reader. You also get HDMI-out, VGA-out, and a mini-DisplayPort connection. The G75VW sports a full-size backlit keyboard with matte-black island-style keys. In addition, the keyboard deck is large enough to fit a 10-key number pad, which is located about an inch and a half to the right of the keyboard (some computers cram the keyboard and number pad right next to each other, which is inconvenient for users--especially gamers). The G75VW's keys are widely spaced and easy to press, and offer good feedback. The large, soft plastic black touchpad has two big, discrete mouse buttons. The touchpad supports multitouch gestures such as pinch-to-zoom, and the buttons are easy to press. Regrettably, the touchpad isn't as responsive as I like to see in gaming laptops, and the cursor seems to drag slowly across the screen. Fortunately, you don't have to use the touchpad: Asus includes a USB-wired gaming mouse that has five buttons and a scrollwheel. Since gamers will probably prefer to use an external mouse with this computer regardless, the sluggish touchpad isn't a deal breaker. The G75VW has a 17.3-inch LED-backlit matte screen with a native resolution of 1920 by 1080 pixels. This screen is an improvement over the glossy display of the Asus G74SX (and that screen was actually very good, save for some backlighting glitches). The G75VW's screen is bright and offers an excellent range of off-axis viewing angles. Colors look great, and images and text appear crisp. Media playback--both streaming HD footage and Blu-ray video--looks fantastic, with sharp images and deep blacks. The laptop has two speakers and a subwoofer, located above the keyboard and placed under a gray metal mesh. The speakers are loud enough, but the default setting has the subwoofer delivering not only the bass, but all of the other sounds as well. The result is a harsh-sounding mess of audio, delivered predominantly from the left side of the machine. You can tweak the sound settings for slightly better results by going to Control Panel > Sound > Speakers > Properties and adjusting the mono-bass from the default setting of 80 down to about 45. This improves the sound quality a little, but audio still tends to have a harsh, raw edge that's painful to listen to. Thankfully, the headphone jack provides clean audio with plenty of depth. That said, it's lacking in general performance, and it's nothing like some of the higher-end gaming laptops we've seen, such as the Origin EON17-S. On the other hand, though the EON17-S has twice the WorldBench 7 score of the G75VW, it also costs more than twice as much. If you're looking for a somewhat budget-friendly gaming laptop, the G75VW is quite capable. But you will need to use headphones. This somewhat cheap gaming laptop has unimpressive performance and awful speakers, but it offers a beautiful screen.